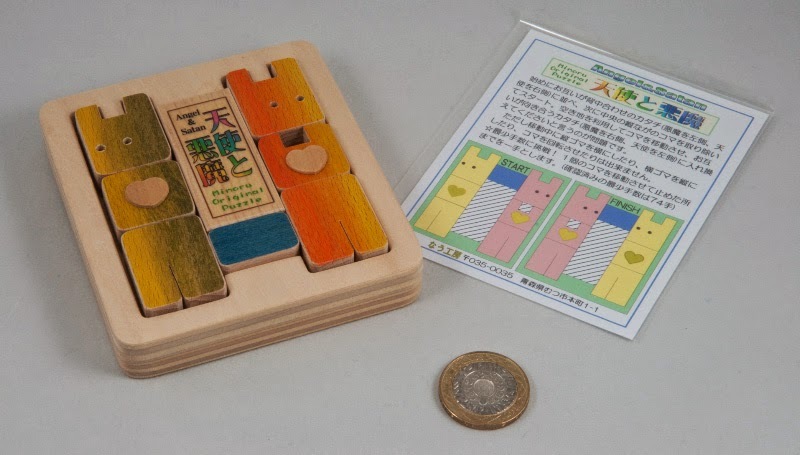 Mineyuki Uyematsu has designed an amazing array of puzzles, but there was one variety that I hadn’t yet had a single copy of: Mine’s outline shape puzzles. As it happened Satomi happened to have a couple on her table at MPP so I took the pair of them. 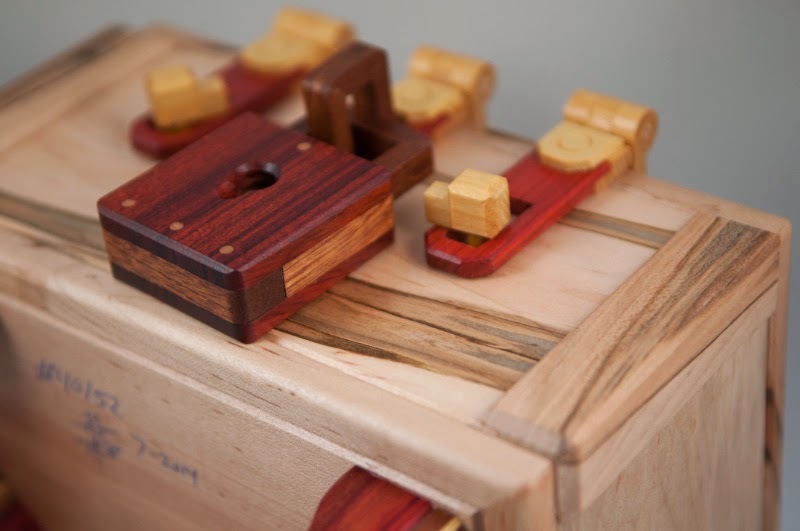 New Pony Puzzle is Mine’s tribute to Sam Lloyd’s original Pony Puzzle from 1868(!) – it consists of two sets of acrylic pieces and a single, larger shared piece. 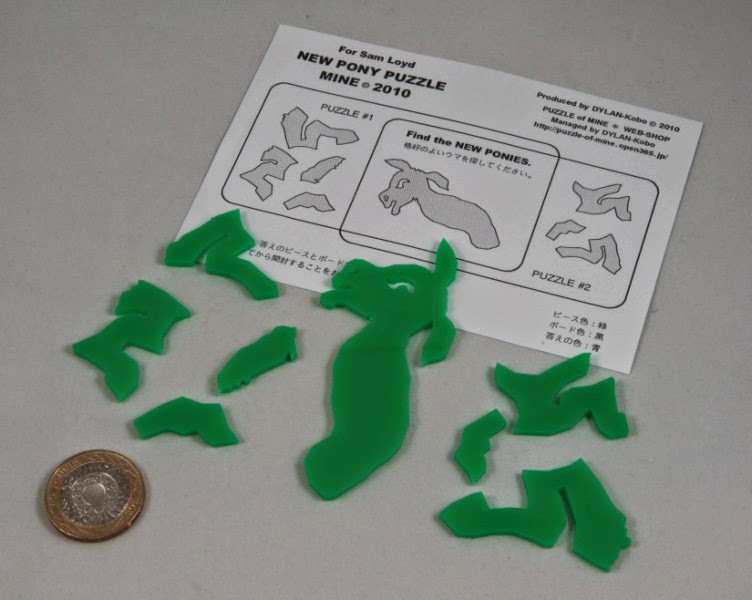 Your goal is to make a horse appear using the two sets of pieces. 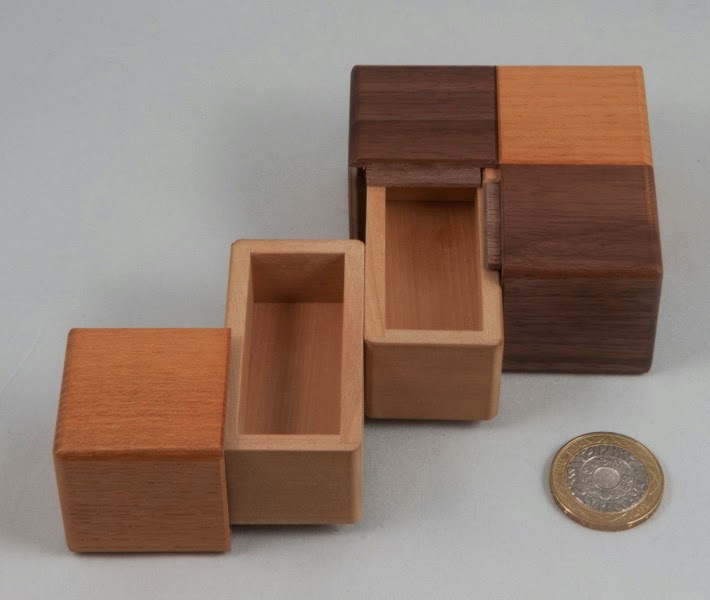 In keeping with the original puzzle a little lateral thinking is required and while both solutions might use the same ‘trick’, they’re pretty different. Bow-Wow Puzzle is in a similar vein. 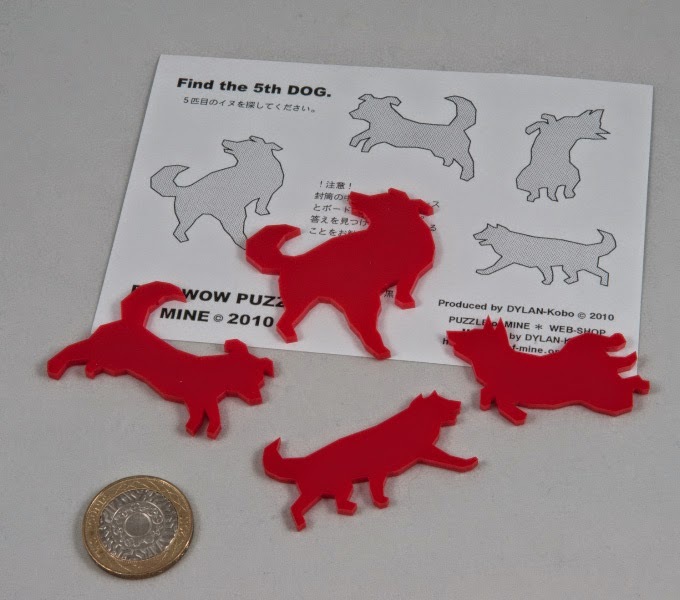 You’re given four acrylic outlines of different sorts of dogs in various poses and your task is to arrange the four dogs to reveal a fifth dog. I found this one a bit harder as the eventual dog is a lot less obvious, although once you find it you’ll definitely agree it’s definitely the hound you’re looking for! 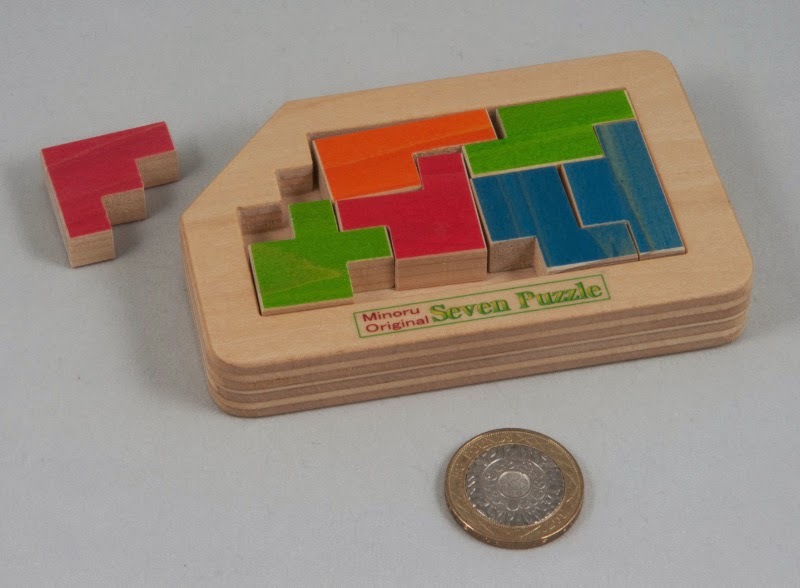 The second puzzle from Minoru is a packing puzzle called Seven Puzzle. Quite simply there are seven hexominoes to pack in an irregular tray … and I suspect there are seven main solutions… (sorry, my Japanese is not even rubbish, it’s non-existent!). The tray and pieces are instantly recognisable as Minoru Abe’s work – pieces in bright colours, all the edges nicely bevelled and a clear varnished frame. I spent a while playing around with this one, with slightly more success than on his Angel and Satan, so I managed to find at least one solution… simple being that I am, that made me rather chuffed. 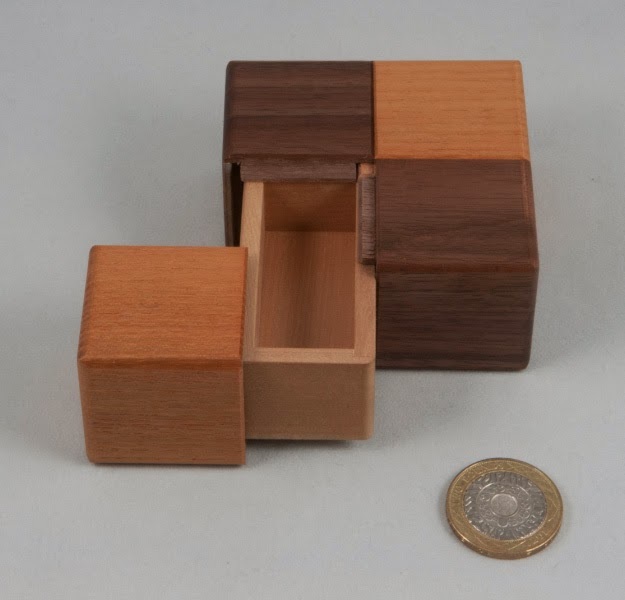 The last puzzle for this post is a copy of Shiro Tajima’s Hermit Crab Box… not so much a puzzle as a really interesting object. 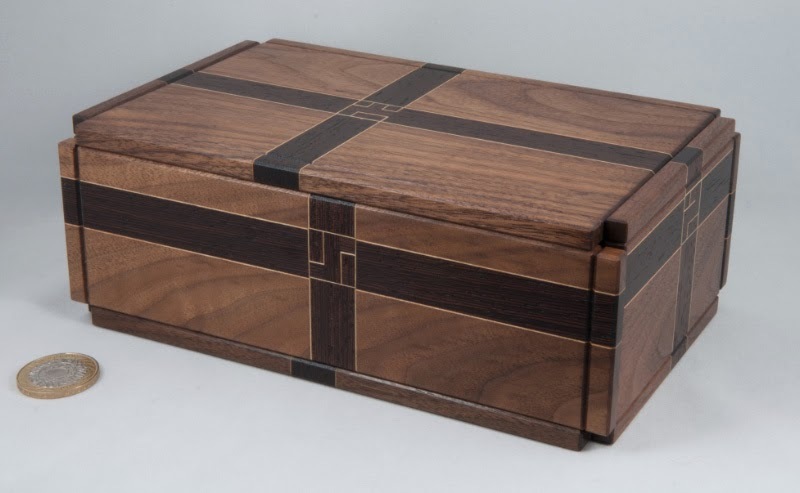 To start with you have a simple square box with a chequered pattern on it – nothing too remarkable about that, but start opening it up by tugging on the right quarter and you reveal a drawer. Change direction and you reveal a dog-leg on the drawer – so far so good – that accounts pretty much for the space in there… except there’s another drawer to go back in the first direction – which shouldn’t really be possible … but there’s yet another twist to go – making this thing the very Japanese embodiment of the Tardis – I like how it makes people think and challenges your perception of space – a lovely playful little creation. gorgeous pictures of every single one of his creations. A couple of weeks later, I received the inevitable ransom demand to release said package from Customs and Gill sorted that out for me before I even knew it had arrived… and it was duly delivered the day before she left for a long weekend in France with some friends – so I had a weekend with a brand new Stickman, not many chores to do and it was tipping it down outside – so I’d just have to puzzle! 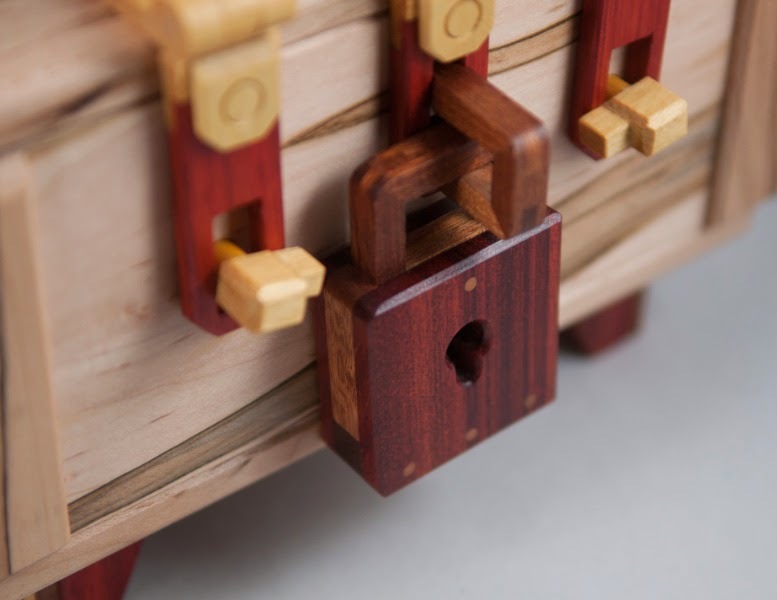 He’s chosen some absolutely gorgeous woods as usual – the grain on the ambrosia maple makes it look like a really old, well-loved chest and the redheart and yellowheart on the straps and hinges really stand out superbly. So, what’s to notice – first off, in case that wasn’t totally obvious already – it’s gorgeous! Yeah, yeah – what do you do with it? OK – the little turn-buckles trapping the front parts of the straps can twiddle, although lining them up, doesn’t release the straps on the front as you might expect – they’ll wiggle a bit, but won’t come free, yet… exploring the straps a bit further, there doesn’t seem to be any give anywhere else on the straps, so we’re probably better off focusing on the front for now. Experiment a bit on the box itself and find a little bit of evidence that some things might not be quite as permanently attached as you might expect – and a big grin appears on my ugly mug – Rob’s disguised some stuff in there rather brilliantly and I realise this box is not going to open the way it “should”! Classic Stickman! …I’m going to gloss over the next several hours of joyous discovery on my Saturday morning but suffice it to say that I had several periods of intense discovery interspersed with a number of patches of Think©-ing. All told I probably spent about three hours getting into the inner sanctum – three hours of puzzling heaven! 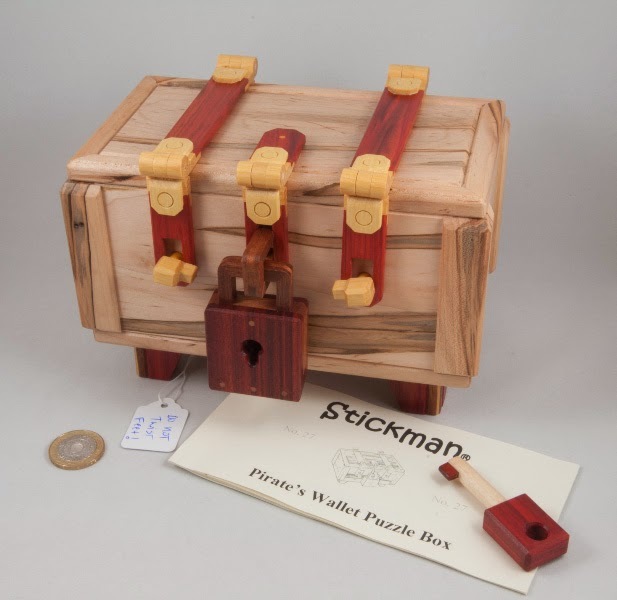 Rob’s created an awesome journey with his latest creation – it’s not surprising it’s taken him seven months to design and make a run of 52 copies… there’s a huge amount of clever design and fiendish engineering in there – and he’s left it all out on display, so when you open the box, you’re able to totally disassemble it and see how every little step works. I should confess to a moment of sheer panic when I started disassembling it (well, you have to, don’t you?) – I’d removed a particular sub-assembly and turned it over to look at the back, only to realise that the mechanism on the front wasn’t trapped, when it fell into my lap in pieces… I’d only just glanced at it before that happened, but managed to get it all back together again. 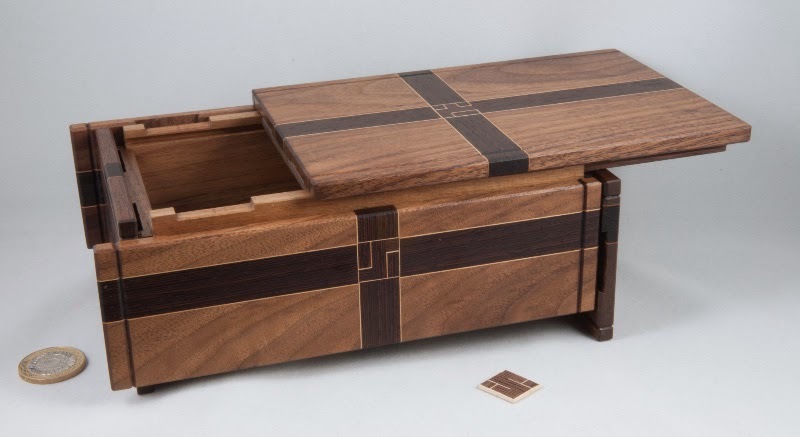 If you’ve read any of my past posts on Rob’s creations, you’ll know I’m a huge fan of his work … but this one is really exceptional – Rob describes it as of “moderate” difficulty – and that’s probably about right, although it’s definitely at the harder end of “moderate” rather than the simpler end. It’s a great puzzling journey as you wend your way through the path to the solution. You’ll find a variety of useful things to help you along the way and there’s always just enough of a clue to where to go next, if you’re paying close attention… and plenty of “A-Ha!” moments along the way. It’s an EPIC experience – a little slice of puzzling heaven on a rainy weekend at home – Thanks Rob – you ought to be mighty proud of this one! 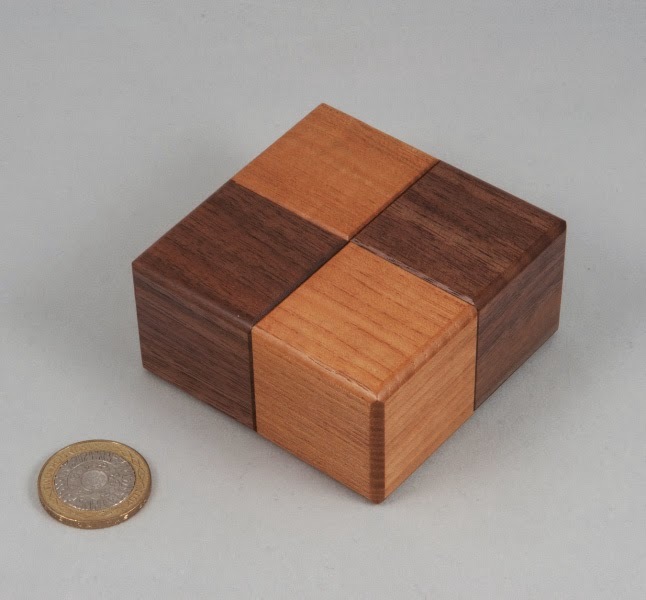 I’m lucky enough to know same rather well-connected puzzlers and every now and then one of them will get in touch and ask if I’m interested in a such-and-such or whether I already have a so-and-so. 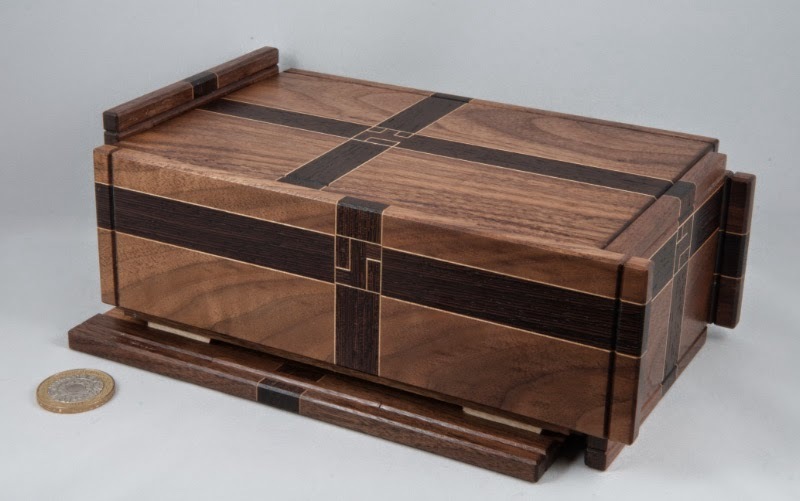 Recently I had the opportunity to get my hands on a beautiful puzzle box made by the indecently talented Kagen Sound (nee Schaefer) - Waterfall Box #5. It turns out that if you packed the first four boxes in a two by two by one arrangement, it would give you a continuous dark line around the resulting block which turns out to be the “map” for the solution to Box #5. (I’m going on faith here since I haven’t seen Boxes 1-4 in the flesh.) and furthermore, when Box #5 is ready to be opened, all of the dark lines on it will be aligned… so you know at a high level “which direction” you’re heading in, although if you think about the fact that you have 83 moves to open this box and only 6 panels, it’s clear that at some point you’re probably going to be back-tracking. To help you out even further, the central decoration on each side is in fact a little map of the 3*3 maze inside that side panel. 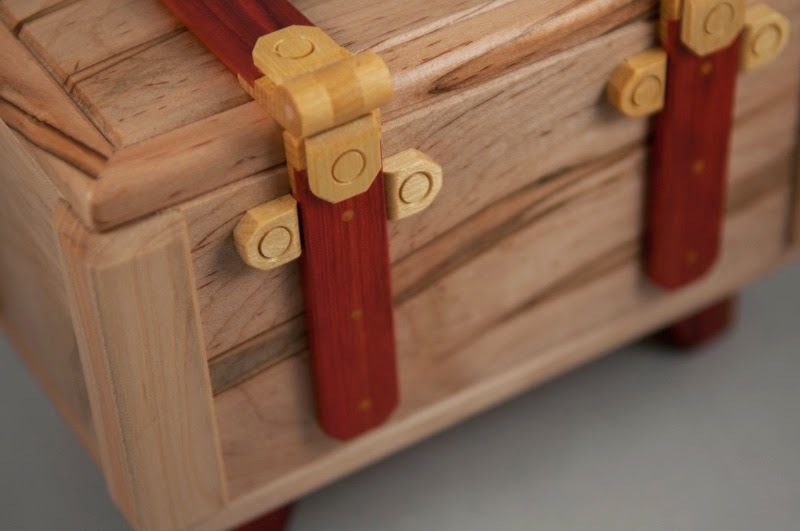 Now with all that help, how hard can it be to open this box…? Pretty hard, it turns out! When my copy arrived, it was still in Kagen’s original cellophane wrapping with the certificate sealed inside, looking like it literally had never been unwrapped, let alone opened. Feeling half-privileged at being the first person to play with this copy and half-saddened that it had been packed away unopened and not played with for all these years, I didn’t waste any time getting rid of the cellophane and began playing with the box. There’s one obvious side to start on (mainly because you can’t move any of the other sides at all!) when I started out moving the panel, first this way and then that, it was reasonably stiff. It loosened up with a bit of exercising and once I’d progressed to working on the subsequent panels, the first one was beginning to work rather smoothly. Getting one panel properly placed frees up the next panel and so on, until you find yourself needing to backtrack in order to get some of your earlier moves undone to allow the test panel to develop further. I found myself thinking about the progress on two levels – trying to work out where I wanted to go at a high level, and then working out how to get things properly aligned a a lower level to allow me to do that. You’ll find a bunch of forks in the road, as it were, and if you don’t think far enough ahead, you’ll risk having to either re-do quite a lot of your work or find yourself right back at the start again. 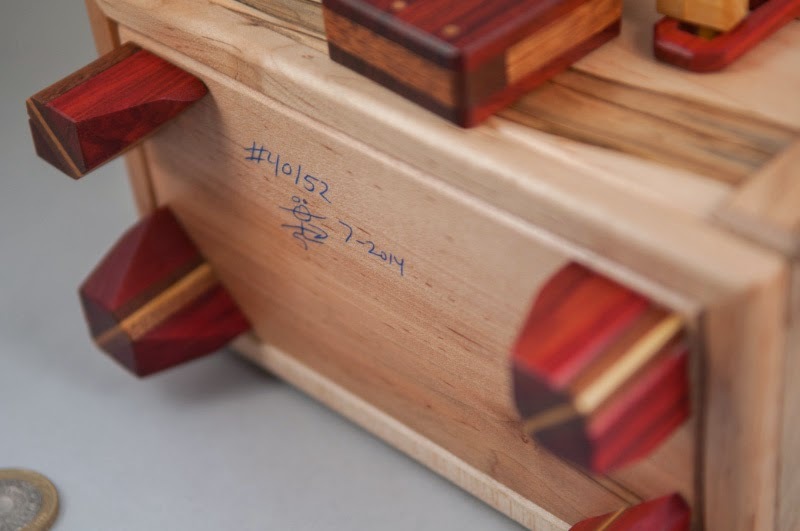 Several folks had a bash on it at Rox’s big BBQ and also subsequently at MPP15 – I don’t remember seeing anyone open it, but they all seemed to be enjoying [p]laying with it… even the blogger in denial about being a secret puzzle-box-fancier!